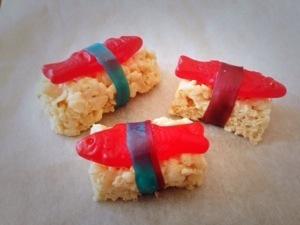 While I can’t take credit for this idea, these are a super cute treat for a party snack. These were a hit at my sushi-loving 7 year old cousin’s birthday party tonight. Kids dig them. Oh my goodness…..what brilliantly talented and gorgeous sister-in-law showed you those? !